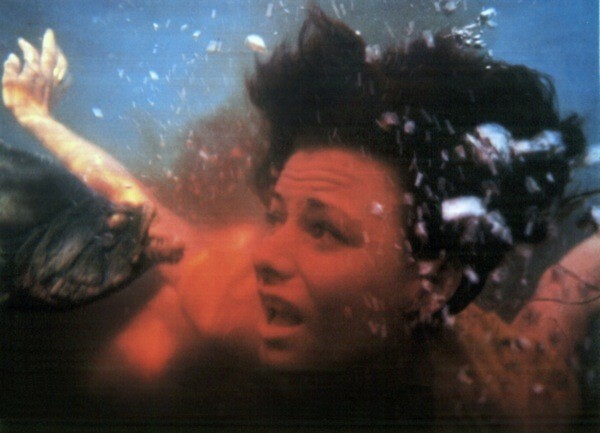 PIRANHA (1978). The years following the gargantuan success of 1975's Jaws found studios releasing an endless stream of copycat flicks of the "When Nature Strikes!" variety — ripoffs included Grizzly (dubbed Claws by industry wags) and the X-rated spoof Gums — but it's generally agreed that producer Roger Corman’s Piranha remains the best of the bunch; even Jaws director Steven Spielberg counts himself among the film's fans. The first screenwriting credit for future Oscar nominee John Sayles (Lone Star) as well as an early assignment for director Joe Dante (The Howling, Gremlins), Piranha sports a sense of humor to go along with the grisly critter attacks, as a boozy woodsman (Bradford Dillman) and a private investigator (Heather Menzies) stumble across a crazed scientist (Kevin McCarthy) who's experimenting on a pool full of mutated piranha; along the way, the couple accidentally release the ferocious fish into a nearby river. This was remade in 2010; other variances in recent times include Piranha 3DD, MegaPiranha, Piranhaconda and Piranha-Man Vs. WereWolf-Man: Howl of the Piranha. Trivia note: The in-name-only sequel, 1981's poorly received Piranha Part Two: The Spawning, marked the directorial debut of no less than James Cameron.